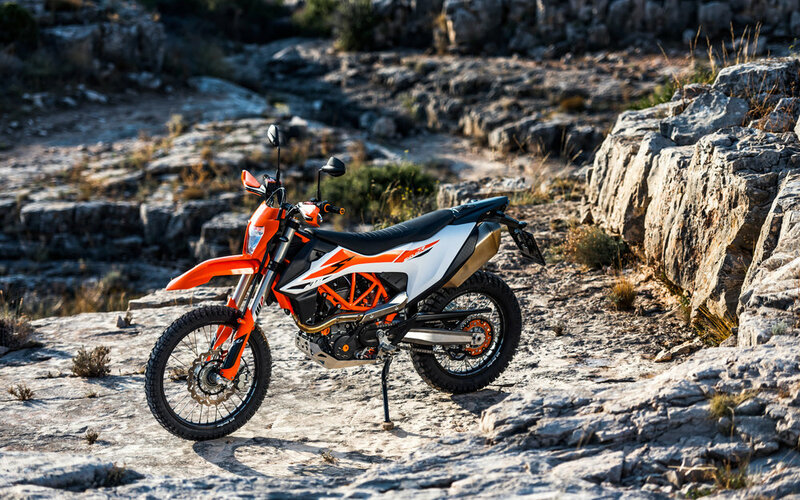 The return of the KTM 690 ENDURO R unites tarmac and trails like never before and is perfectly positioned for riders looking for a long-distance Enduro machine with addictive performance that also benefits from advanced electronic systems. At its heart beats the latest version of the LC4 engine; a powerplant that originated over 30 years ago from Hard Enduro KTM machines and its ability to excite in this arena has only increased with the new generation KTM 690 ENDURO R. This unique engine benefits from constant evolution, experiences learned from racing single-cylinder engines on and off-road in world championship competition, as well as KTM’s commitment to producing high performance ‘monos’ for their truly distinctive character and packaging abilities. More power and torque were logical progressions – 74 hp and 73.5 Nm – but this comes complete with refined delivery; improved smoothness, response and efficiency. Evolution means retaining everything that was good about the previous model and building on that. Under the new seat and fresh bodywork – both sharpened for style as well as better movement on the bike – is an all-new chassis. Designed to be confidence-inspiring with ease of handling, it is ready to tackle everything from easy trails to extreme off-road obstacles as well as being a competent street bike. Complete with an enlarged fuel tank capacity of 13.5 liters (+1.5 l), the result of this dual-purpose position negates the need to trailer or van it to an excellent riding location or connect favorite trails. Equipped with lightweight, CNC milled hubs mated to high-end 21" and 18" rims fitted with grippy and enduring Mitas E07 tires, at either end of the KTM 690 ENDURO R are fully adjustable WP XPLOR suspension that offers a level of control usually only seen on competition off-road bikes, while keeping things planted on the street. Specially adapted from the world-beating KTM EXC range, the WP XPLOR fork provides a split-damping system and is bolted to the main chassis’ lightweight sections of top-quality chrome-molybdenum steel tubes via highly rigid and forged triple clamps. 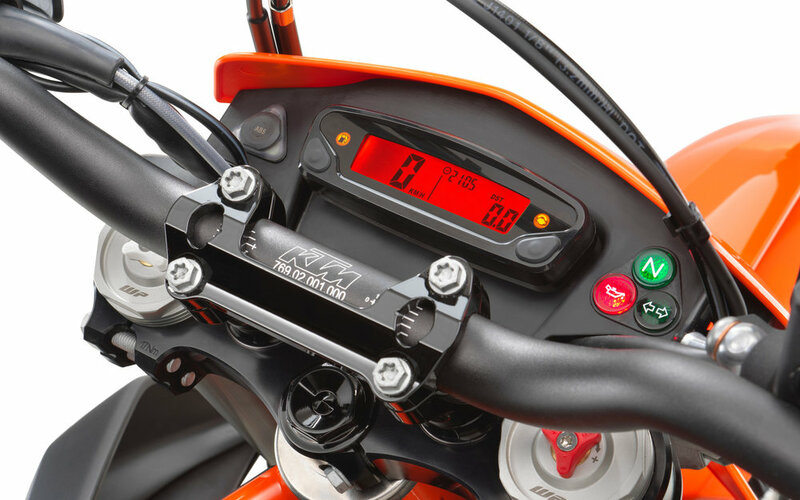 The WP XPLOR shock absorber, connected to the single-piece cast swing-arm by linkage, produces a progressive suspension character and high resistance against bottoming out. Allowing riders to get the most from this multi-terrain machine in all situations and conditions, the new KTM 690 ENDURO R is more sophisticated than ever. Equipped with an array of top-level electronic systems, including lean angle sensitivity to braking and traction functions, it also boasts two different ride modes – Street and Off-road. These can be switched from the handlebar to provide different behavior from the throttle response and traction control systems. 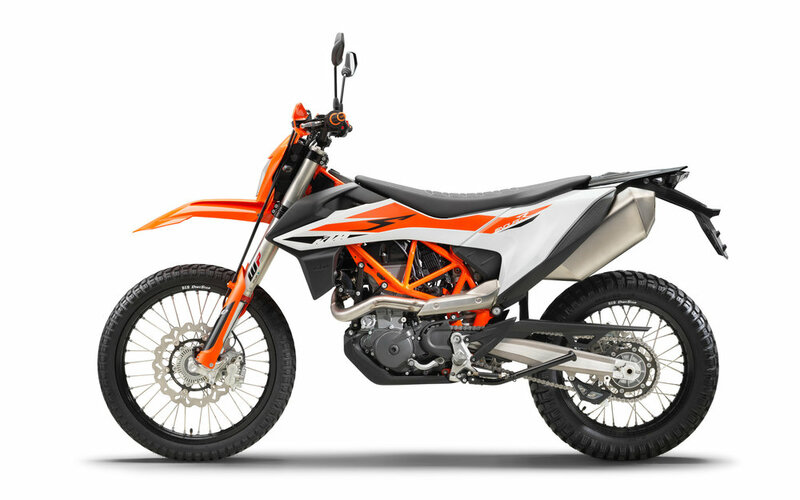 Off-road ABS allows rear wheel lock-up and reduced ABS on the front wheel while motor slip regulation (MSR) is an engine brake control designed to prevent rear wheel lock-up – even on low grip surfaces – perfect for street riding. The addition of the Quickshifter+ produces effortless, clutchless up and downshifting through the 6 speed transmission – perfect for when charging down a familiar section.